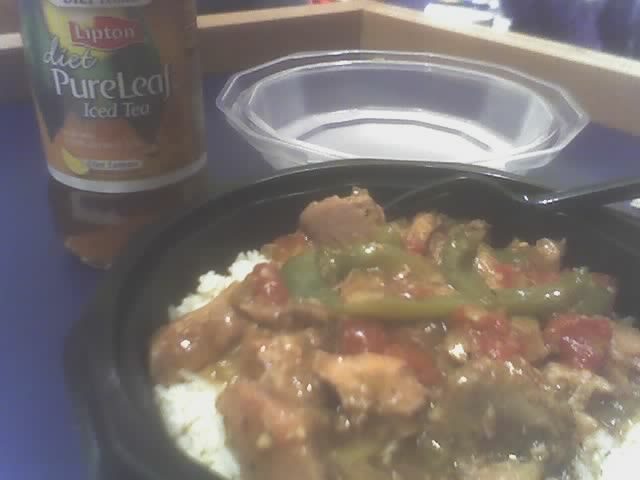 State Forbes Cafe entree: Chinese pepper beef, on white rice. Half bottle of Lipton PureLeaf iced tea in diet lemon. The nutrition tag on the entree said it was 350 calories per serving. Though I'm pretty sure that doesn't include the rice. So all in all, I would say that I had 1 cup of rice plus most of the pork, giving me a total of 550 calories for this entree. The pork was okay, a little bit on the dry side. Though I did like the sauce and the bell peppers. It didn't taste like Chinese cuisine though, the whole dish reminded me of Mexican cuisine, with the peppers and tomatoes and all, which gave the overall impression of pork fajita. The diet lemon iced tea was okay, but I'm not too fond of the diet lemon flavor. It's so fake that it's almost sickening. I'm not sure why it's so hard to make lemon taste without using real sugar. You'd think they could just rely on lemon juice to lend its flavor. My favorite Lipton tea is the regular peach flavor though, it's really nice. Not quite sure what the new brand name for the tea is supposed to mean. PureLeaf? It says made with fresh brewed tea, but aren't all of Lipton's flavored iced teas like that? 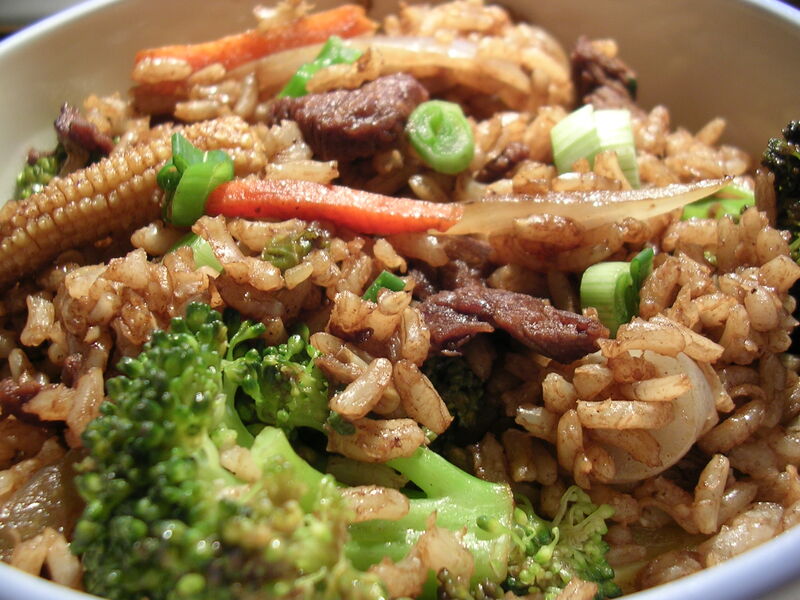 2 cups of beef stir fry with assorted vegetables and brown rice in teriyaki and soy ginger sauce (1.2 cups brown rice, 250 calories, 2/3 cup of vegetables, 40 calories, 2.5 oz. beef, 150 calories -> total is 440 for 2 cups of this stir fry). Very healthy stuff this is, with all the brown rice and veggies, and just a bit of beef for protein. But it's a bit boring to eat, and the brown rice is dry. The beef was wonderful though. The stir fry chef didn't overcook it today because I was the only one waiting in line for an order, so the beef was juicy and tender and had lots of flavor. I sure got a TON of this stir fry though. It came out to 6 cups total, so I have like 2 more meals I can make out of this haha. Anyway, enjoy the picture, I'm trying to learn to take better/more appealing food photos. 1 Asian pear (100 calories). Last one in my fridge! Now I just have grapefruit to work on heh. 1 packet of prepared Nestle fat free hot chocolate with calcium (25 calories). I got smart this time and used less water to make my hot chocolate. Apparently the packet says you only make it with 6 oz of water, and lo and behold, it actually tastes somewhat like hot chocolate if you do that. Of course, the whole fat free-ness of hot chocolate makes it a lot less rich, but I just needed a little something to help get me through another half hour or so of reading. I've been having some trouble falling asleep lately, I'm not sure if it's because I stay up too late or because I'm just stressed out in general about mcats and schoolwork, but it helps to have some hot chocolate beforehand I think. Total for today is about 1200. I think it's good that I'm indulging less in junk nowadays, although my low calorie count bothers me. I'm either counting wrong, or I'm eating too little for real, or my metabolism is slowing down. None of those seem too fantastic. I can't wait until the schoolwork and med school stuff subsides a little so that I can spend more time exercising. That way I can avoid most of the problems I just mentioned above. This entry was posted on Tuesday, April 3rd, 2007 at 2:23 am	and posted in beef, beverages, Chinese, fruit and nuts, rice and pastas, Uncategorized. You can follow any responses to this entry through the RSS 2.0 feed.